The ONLY hand strengthening exercises for MUSICIANS! Click below to get the digital book FOR ONLY $22.50! "I am excited. The Cowling System© is "Wow"! I cannot put what I'm feeling into words - I can only say thank you for this AMAZING system. "I am a professional musician here in Las Vegas Nevada. "I have been playing Bass Guitar for over thirty-five years. 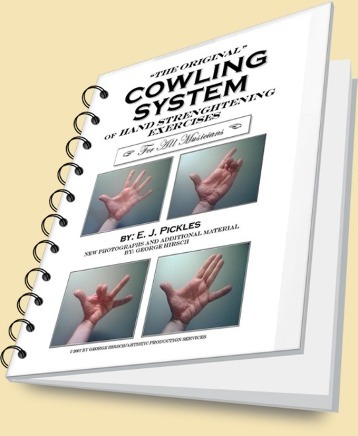 With the Cowling System© of hand strengthening exercises, my hands feel brand-new: rejuvenated, fast and accurate. "My fingers actually do what my brain tells them to do without getting confused. Thanks for a exercise book that actually WORKS. "ps: I am only into my first week and my fingers feel like butter!" Once you get to understand the long-standing and common-sense principles which The Cowling System is built on, you'll see how and why such rapid gains in musical skill are possible. Third – THE MIND CAN AND DOES AFFECT THE BODY'S RESPONSE TO EXERCISE. And, Fourth – To really shine as a musician, one should develop CAPABILITY in EXCESS of NEED – also referred to as "MARGIN" or "RESERVE". HAND STRENGTHENING EXERCISES - First Principle - PLAYING A MUSICIAL INSTRUMENT IS A PHYSICAL SKILL, REQUIRING PHYSICAL EXERCISE. Think of a Musician as a kind of Athlete - In that way playing a musical instrument is similar to Dancing, Figure Skating, or Tennis, though focused on the hands, of course. In attaining a physical skill, the wise athlete does NOT train his body in ONLY the actions and/or motions of that skill - [Let's call these particular actions and motions "the moves"]. An athlete does NOT train and drill by repeating ONLY those "moves". The athlete includes more comprehensive exercises in ADDITION to, and usually BEFORE learning "the moves". The most familiar example of this is in the field of Dance. Dancers use exercise systems such as Pilates and Yoga extensively to train muscles otherwise unaffected by repeating "the moves" over and over. This therefore limits the body in Dance or any other sport or activity, or as in a MUSICIANS case, the hands, to ONLY being able to execute those moves which had been practiced. So, when THOSE unused muscles are now suddenly called into action, either by attempting NEW moves or attempting different ways of doing existing moves, or attempting to increase speed, etc. what happens? The muscles, ligaments and tendons THEMSELVES will resist change and improvement! * Forcing oneself though that wall which may then risk or incur injury. By following The Cowling System of hand strengthening exercises correctly, a musician could significantly reduce the chance of these difficulties occurring or even eliminate all of these BEFORE they had a chance to develop. The "Bottom Line"? : NO technique, good, bad or indifferent, will function fully if THE HAND ITSELF is deficient in some portion. And by the way: The MOST deficient portion of the hand, in string and keyboard musicians especially, tends to be THE FOURTH [pinky] FINGER. The COWLING SYSTEM handles this problem "with authority". It takes up the Fourth finger with a targeted finger exercise which will advance your playing substantially. In addition; The Cowling System - the ONLY system of hand strengthening exercise of ANY kind which has specific exercises for conditioning the hand's TENDONS and LIGAMENTS. You will be quite pleased, perhaps even amazed at what occurs when the ligaments which surround your WRISTS are actually loosened in one of the Cowling System's exercises - the SECOND exercise! Does the MIND influence exercise? Get the answer. At what point do the technique and the instrument "disappear"? The Cowling System can help get you to that point. Get the information.